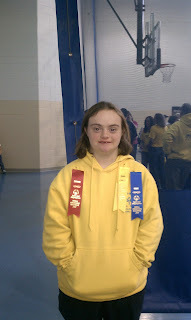 This past weekend Alex participated in the Special Olympics Regional Aquatics Meet. She has improved since last year and managed to snag a third (freestyle) a second (4x100 Relay) and a first in the backstroke. John and I are quite amazed at Alex’s backstroke; she swam straight with perfectly coordinated hands and legs. She had never really mastered the backstroke until this year. Kudos again to her unbelievable coaches. The Special Olympics is one of Alex’s many communities and a very important part of her life. Lately I have been obsessed with Alex’s prom experience and my concern about the school’s suggestion Alex ask her Special Olympic girl friends to attend with her. I have analyzed and overanalyzed my aversion to this suggestion, and in the end have accepted my gut feeling, this was not an acceptable solution for Alex, at that time and place. In my quest to understand, I keep returning to the idea of community, and particularly an “inclusive community”. I try to reconcile this idea of community with Alex, and I keep arriving at the same place, a philosophy of a sense of belonging for my remarkable daughter. Alex is just as deserving of a community, or communities as anyone else. A community who values the gifts Alex brings and does not focus on her disabilities. Community is a way of relating to other persons as brothers and sisters who share a common origin, a common dignity, and a common destiny. Community involves learning to live in terms of an interconnected "we" more than an isolated "I'. It involves making choices which reinforce the experience of relatedness and foster the sense of belonging and interdependence. Community begins, but does not end, in our face to face relationships with the persons who are closest to us. We are all parts of many communities and bring diversity to each one. 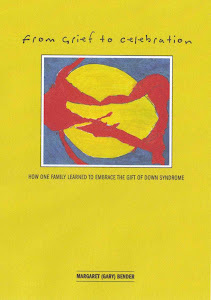 For example I am part of the Hughes family, but we are the ones who live in Colorado and have the daughter with down syndrome. I am part of the Bender family, but the only catholic in the clan. I am part of my college community, friends from 30 years ago who are still bound by four common years of learning and growing, my gift is living in the best place to visit. The list goes on and on, the tennis community in our valley, past work associates from various employers and so many more. Having a sense of belonging is my vision for Alex, Courtney and Tom. Alex's IEP has goals in place to assure she has the tools to advocate for herself to realize this dream. For example, I believe speech articulation and conversational skills are important for Alex and I argue for more speech therapy every year. I believe social skills are important for Alex and I argue for peer groups each year. Basic reading and math are important and I argue for tougher reading and math goals each year. Alex loves sports and I argue for play time on the basketball team each year. This may seem like a lot of work on my part, but it is not, the reward far exceeds the effort. However, these are the tactics, not the results. The results are in the communities Alex chooses for her life. Just like us, Alex can choose to participate or not in any community, this is a basic human right, whether or not she has a disability. It is her decision, no one else’s, our job is to facilitate these choices for Alex. Alex is a member of the Special Olympics Community. It is an inclusive community, everyone who wants to join can, in whatever capacity is appropriate. Each event is attended and supported by coaches, volunteer, families and in many cases the local population. Everyone feels a sense of belonging, where the athletes are supported by everyone, and an individual’s inabilities are never mentioned. The athletes are praised; the coaches appreciated and the parents proud. I am a part of that community and feel a profound sense of belonging and comfort. Alex is a member of the WindWalkers Community, where she rides and volunteers. WindWalkers has a similar approach as the Special Olympics; this community includes families, peers with and without disabilities and a staff that is inclusive and supportive. We have all become part of the WindWalkers family. Alex feels important and contributing and I feel a special sense of belonging with this community. Alex is part of the Hughes and Bender family Communities. Once again she is included and valued for what she brings to the family. No one ever underestimates her; she makes her own decisions, voices her own opinions and is known as the “funny one”. She brings so many gifts to our families and we learn from her every day. Alex is also a part of her High School Community. She participates in the school plays, attends three regular Ed classes (with support) and loves to attend and be a member of sports events. Alex’s IEP is written to support her in theses activities and ensure her success. Her teachers work hard to implement her goals and most of the time Alex feels she belongs. High School is an unusually difficult community for many teenagers, kids will naturally create sub groups as they begin to understand social norms and experiment with their meaning. Natural exclusion occurs and it is a difficult time for many students including Alex. Alex recognizes this and like many teenagers subconsciously avoids situations which will make her feel different. She wants to fit in, and although self confidence and independence is extremely important for her, we try to facilitate inclusive community opportunities for Alex. The prom is the perfect example of this, Alex’s desire, just like all teenagers was to attend the prom with her peer group. These are the people in her high school community who should make her feel valued and included. These people exist occasionally in Alex’s high school, but the idea of consistency in these relationships is not implemented, and that is where my gut reaction kicked in. Alex did not want to create a sub community within her high school group. She did not want to invite people from her other communities, the Special Olympics or others. Alex rightfully desired to go to her High School prom with her high school community. Why should her desires be different than anyone else’s? Why should her opinion be dishonored? My simple answer, they should not be. I try to understand the High School’s opinion that Alex ask her Special Olympic friends to attend the prom with her. They rightfully believe Alex feels included and confident with these girls. Despite the usual girl pouting episodes, like all teenage girls, these girls are supportive and encouraging of each other. But there is a difference, these girls are not part of Alex’s high school community, nor do they want to be, they attend their own high schools, not Alex’s. My angry response to this request came from frustration, not any desire to disrespect the friendship these girls share. Very simply, Alex wanted to go to the prom with her peers. Equally simply, she did not have the opportunity. From my perspective this was due to poor planning and a last minute recognition Alex’s IEP was not being followed. In many ways Alex is a part of her high school community. Every student and teacher in her small rural high school knows Alex. When walking down the hall with Alex I hear “hi Alex” from every other student and teacher. Her teachers and the administration care about Alex, monitor her education and teach her as well as they can. But there is one part of Alex’s participation in her high school community that we need to work on, the community is not inclusive, Saying hi to Alex is not enough. All kids, with and without disabilities should be invited to participate with their peer groups on the sports team or in their school proms, no matter the abilities. It should not be such a struggle for Alex or any student to feel included. As previously quoted: "community begins, but does not end, in our face to face relationships” there is more to a community than acknowledging a member, it is about accepting the member. This idea of an inclusive community is a change in the approach and support every student is entitled to receive to succeed as adults. I know Alex wants to feel included in every one of her communities, just like me and just like her peers with and without disabilities. In my humble view, this is a basic human right. It is not beyond my sense of irony to recognize Alex’s song for the talent show “That’s what Friends are for” from the Jungle book relates directly to the prom. Magic. Thank you for this wonderful post that addressed my previous question. I agree with your reasons, but perhaps I just feel differently because the majority of my friends in high school attended another school--we would all go to each other's proms because that's how we would have the most fun. However, you are absolutely spot on in your view of community and Alex's relationship to them. thanks - so hard to explain and create.. In many ways Alex's experiences with the prom were completely typical. It is sad how the school reacts though- so adversarial! She has her niches and your wonderful support. Coping with disappointment is so hard to learn and I hate seeing my child crushed too. Hugs and more success- I raise a glass to you and yours! 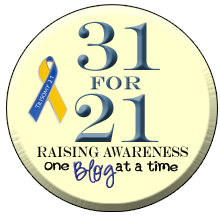 Thanks Starr for the blog info and support. April - thanks to you too...I am at a loss sometimes - Alex's school is very small and there is only one other student in her classroom - this girl just turned 18 and in the process of transitioning to the Transition porgram. This is great as Alex gets a lot of one on one instuction - but not so much peer support. It is so tempting to look at another high school, but she would absolutley refuse to move. Alex is in "Taking Charge" the PEAK program, it just came to our Valley by special funding from the CO Developmental Disabilities Council - I am a PATH Facilitator and the issue seems to be getting the school to support Person Centered Planning and actively promote it - - We have a PEAK mentor here but she works only a few hours a month. PEAK just lost about 75% of their funding and are scrambling to figure out how to stay alive. Many girls in Alex's class went with each other, and when Alex asked at the last minute they were "busy" I do not think this would have been the case if Alex had been supported in asking the girls earlier. So not by way of excuse - but small, not so well funded school districts have theit own host of problems - not only with regular ed kids, but the step child special education kids they are mandated to educate. So we just plug along, have started a SEAC and feel some positive momentum for the next generation of students who will live in our beautiful valley - thanks for letting me share. Thanks for sharing your thoughts and Alex's experiences. I went to the Ds symposium in town recently on education and it was very interesting. She really focused on community too. We will be in a very small school too and I think this can add some extra challenges.